West Bengal chief minister Mamata Banerjee dharna politics that ended Tuesday evening after the Supreme Court order on the Central Bureau of Investigation (CBI) controversy, make the headlines for the third day in a row. Most newspapers treat the developments as impartially as the top court was in its ruling. However, The Times of India and The Telegraph clearly identify a villain and a winner. TOI, in “SC: CBI can quiz Kol top cop in Shillong, but not arrest him. Delhi & Didi claim win,” writes the verdict puts “an end to the West Bengal government’s aggressive resistance” to the CBI. It cites Mamata Di’s “massive mobilization” of state police to detain CBI officers and lay “siege” to its office. TOI also censures her in its edit, “Loss of Face” (See Opinion). In “Wham! 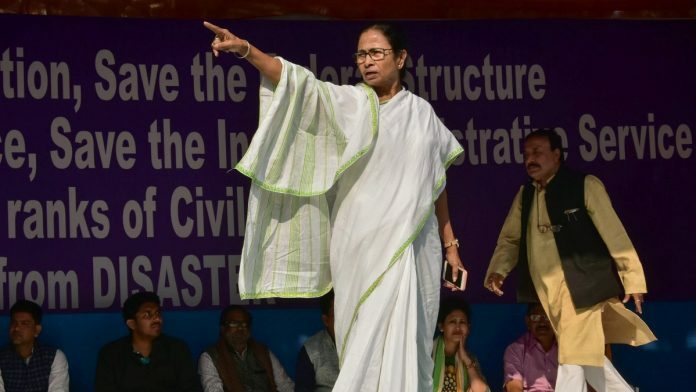 How to give it back,” The Telegraph declares Banerjee the sole winner for one reason: she “has positioned herself as a national trendsetter who struck back with ferocity” against Prime Minister Narendra Modi. The Indian Express and TOI have exclusives today from UP. Just a week ago, the Modi government had moved the Supreme Court requesting land “around” the disputed site be returned to its rightful owners — one of them, a VHP associated foundation. “This reduces pressure on the BJP government and lowers the heat ahead of the polls,” Express concludes in its ‘Explained’ box. TOI’s exclusive is more disingenuous. In “UP govt to drop cases against 100 accused in Muzaffarnagar riots,” the bare-bones report does not mention the names of the accused or that they are Hindu. That information is buried on page 21, under a vague, if not misleading headline that reads “BJP MP: SIT cleared the rich, slapped cases on poor”. In other big news, the top court rebuked the Modi government for trying to “destroy” the NRC process. The Centre moved the Supreme Court for an extension on the NRC deadline, due to the impending national polls. “The court observed that the government seemed hell-bent on stalling the work,” writes TOI, and refused to budge from the 31 July deadline. The Kolkata standoff dominates editorial comment, this morning. Demands of “police reforms to insulate the force from external pressures,” aside, “the real reforms… has to start from the civil servants themselves”, writes HT. “Enough politics has been played and people are not fooled,” TOI concludes. For the third evening, most news channels, English and Hindi, focused on various aspects of the political drama in West Bengal. To relieve the monotony, Congress replaced the TMC as a topic of discussion on some channels: Times Now went after it on disenchantment within the National Students Union of India (NSUI), Harvest TV spoke to Milind Deora on discontent in the Maharashtra Congress and CNN News18 looked at Priyanka Gandhi Vadra’s first 48 hours since she returned to India. But it was still Mamata’s evening. “Mamata Banerjee talks like ‘gali ka gunda.’ When police tries to catch her… she throws stones at the police,” observed BJP leader Shrikant Sharma, rudely. In an unusual moment, the Communist Party of India (CPI), that opposes Mamata in Bengal, appeared to come out in support of her: “BJP has tried to frame a police officer as a criminal,” said CPI leader Amir Haider Zaidi. Aaj Tak anchor Anjana Om Kashyap discussed Uttar Pradesh chief minister Yogi Adityanath’s rally in Purulia, West Bengal. He had travelled there by road from Jharkhand after the Mamata government refused landing permission to his helicopter. India Today and a C-Voter survey found that BJP’s vote share in Bengal had jumped from 17 per cent to 32 per cent by cutting into the Left’s vote share. More importantly those who have lent support to the West Bengal Dharna are those who are battling serious allegations of economic improprieties, criminal misconduct and even corruption. Can “New India” be ever run by this Kleptocrat’s Club?